Western Sydney Business Connection - What does the new 'Western Sydney Innovation Corridor' mean for your business? What does the new 'Western Sydney Innovation Corridor' mean for your business? Event registrations have now closed. 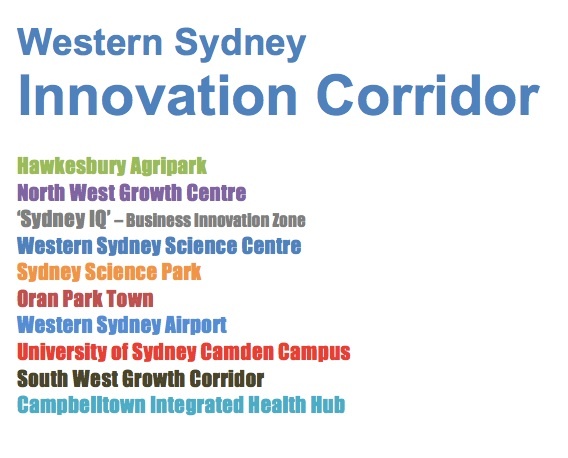 Western Sydney Innovation Corridor - an interconnected span of knowledge-driven commercial hubs. Find out what this economic development strategy can do for your business. The University of Western Sydney is building partnerships to deliver the Innovation Corridor. Discussions with government, industry, the community and the broad range of Corridor supporters are building the momentum, expertise, backing and commitment necessary to take this bold step. Delivering our keynote address for this event will be Prof. Barney Glover, Vice-Chancellor, University of Western Sydney. Where will your business benefit along the corridor? The infrastructure investment has been made. The planning framework is established. The market is ready. The expertise abounds. All that is required is for us to take the next step and make Sydney’s smartest concept a reality. Attend this event to see how and why you are important in making this happen! Members please note this event is not part of your membership complimentary seat allocation. With our third consecutive event of the year sold out, WSBC has helped 345 businesses connect with over 760 business professionals in 2015. 1. You can entertain your clients or prospects by hosting your own table. Ask us about our special rates when booking a table of 8. Registrations close at 5.00pm on Wednesday 17th June 2015 or earlier if sold out so secure your seat or table early to avoid missing out.